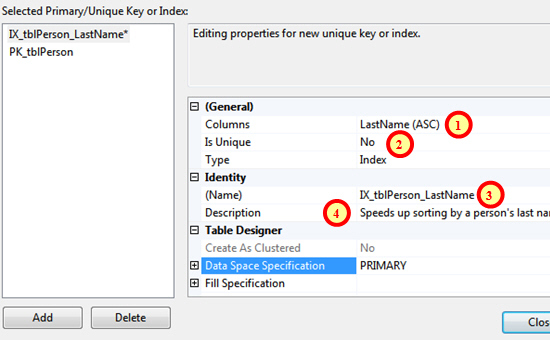 A guide to how to create databases in SQL Server Management Studio, including creating tables, indexing columns and using database diagrams to create relationships between tables. This blog is part of the Wise Owl online SQL tutorial. We also run classoom-based courses in SQL. The two tables in our database, with the relationship linking them together. The last thing I'll look at in this blog is how to speed up sorting of tables, by indexing columns. What is an Indexed Column? The people in surname order. Moira Anderson appears first, as her last name comes first in alphabetical order. The index shows where each person would appear in the list if you were to sort the table by the LastName column. columns that you frequently will want to sort by (the LastName column, probably). The downside of indexing columns is that it takes longer to add new records (indexes also take up a fair amount of memory). Right-click on the table whose column(s) you want to index, and choose Design. Click on the tool shown (if you can't see this Table Designer toolbar, use the menu shown below instead). Choose this menu option as an alternative to the tool shown. The primary key is automatically an index - but you can Add another index. Choose which column or columns you want the index to affect (when you click in the box, you'll have the chance to change the column). Here the index will be for the LastName column. Choose whether duplicate values for the index are allowed. Here the LastName isn't unique (once you've entered one person called Smith in the table, you don't want to be restricted from entering any more). 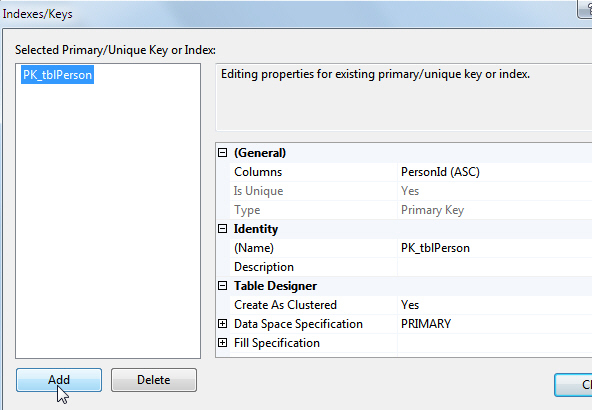 Typically only the primary key in a table is unique. Give your index a name. As for relationship names, index names have to be unique for a database. One way to ensure that this is the case is just to suffix the default name given (IX_tblPerson) with the name of the column being indexed. Optionally, type in a description of the index. Complete the numbered steps as shown above. When you've finished choose Close, then save and close your table. 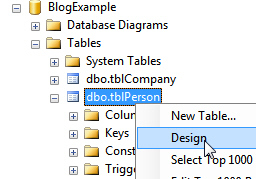 As mentioned earlier, columns which are part of relationships will not automatically be indexed by SQL Server - so you should also index the CompanyId column in the tblPerson table.